(Nanowerk News) Are you sick of your phone’s battery dying after only a few hours? Researchers from the Norwegian University of Science and Technology are hard at work on improving something called the solid electrolyte interphase as a way to boost battery life. Lithium batteries are everywhere – in ships, cars, laptop computers and mobile phones. But they begin to decrease in capacity the minute they are put into use. Perhaps one day, we will be able to use our batteries at temperatures as low as -50 degrees C, as opposed to the meagre -10 degree limit we have today. But that is likely a few years in the future. Ahmet Oguz Tezel, Ann Mari Svensson and Svein Sunde. A lithium battery is made up of two electrodes, which are two pieces of conductive material with opposite charges. The negative electrode is called the anode. The anode in a lithium battery is made of graphite, which is a form of pure carbon. Between the two electrodes is an electrolyte, in this case a lithium salt dissolved in an organic solvent, that carries lithium ions between the two electrodes. NTNU researchers are working on improving batteries by changing the composition of this electrolyte. When the battery is first charged up, a thin film called an SEI (solid electrolyte interphase) forms on the surface of the carbon anode. This film has a complex chemical structure containing both organic and inorganic lithium compounds. 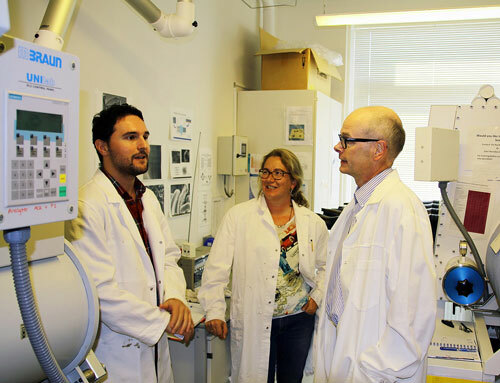 “This film is an essential part of the battery,” says Professor Ann Mari Svensson, from the Norwegian University of Science and Engineering’s Department of Materials Science and Engineering. The SEI film forms the first time the battery is charged, from the reaction between the electrolyte and the anode. This protective coating is key in determining a battery’s lifetime, thermal stability and capacity, especially at high rates. Lithium that is bound in the film doesn’t participate in charging the electrodes which results in reduced capacity. “Once the battery is assembled, we cannot add more lithium to the cell, and therefore limiting the loss of available lithium in the cell is of prime importance for long lasting batteries,” says Ahmet Oguz Tezel, a PhD candidate at the Department of Materials Science and Engineering. If you can’t add more lithium to the solution, you have to do a better job of preserving the lithium that is already there. Tezel has recently handed in his PhD on the formation of SEI films, and how this is influenced by the composition of the electrolyte that is used. Tezel’s work has focused on modifying the electrolyte to achieve higher battery capacity and life span, especially at low temperatures. He has also had promising results with his work with developing a preparatory treatment that prevents too much lithium loss in the formation of the SEI film. This allows more of the lithium in the electrolyte solution to participate in charging the electrodes. State of the art electrolytes that consist of ethylene carbonate (EC), in principle, cannot operate when the temperature is at about -10 degrees C, due to the high melting temperature of the EC. On the other hand batteries containing the organic compound propylene carbonate (PC) can work at temperatures as low as -50 C.